Dieppe, on the Normandy coast, is tied to Sussex by centuries of sea crossings. Nowadays, the ferry from Newhaven is a gateway to France - carrying up to 40 lorries and 600 passengers two or three times a day in each direction. As the UK makes preparations for a possible no-deal exit from the EU, how are people in Dieppe responding? 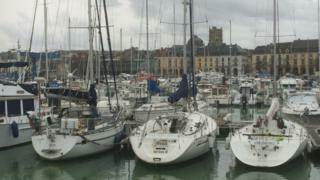 I've come to the historic port of Dieppe. You could draw a straight line from Paris to London, and it would pass right through here. "I've got nothing to say on that," snaps one vendor, barely glancing up from her work. "I am not well informed." Another passer-by strikes a more conciliatory tone. "I don't think it's going to change a whole lot. I hope our relationship will last." In January, it activated its plans for such a scenario, and 50m euro is being spent across France's ports and airports. "The challenge for us is to reassure local people, because there are many of them who work around the cross-channel route. "We're also asking for a fourth daily crossing, all year round, between Dieppe and Newhaven. If we were to get back 1%, 2%, 3% of the freight from Calais, then we'd multiply by two, by three, by four the freight to Dieppe and that would be economically important." "Pah! That's a very English question! C'est la vie. We've got to adapt." How would Brexit affect UK citizens in the EU? In the afternoon, we're off to the races - Dieppe's well-manicured hippodrome, which has its own role to play in the town's Brexit preparations. I'm joined by Agnes Sibers, president of a European racing club - the Fédération Internationale des Gentlemen-Riders et des Cavalières. She explains: "Since British stallions are the best, and Norman ones are as well, British owners tend to send half of their mares to Normandy to get covered by French stallions. "And going the other way, French owners and breeders send their mares to Ireland and England to be covered." Image caption Dieppe hopes to have the necessary infrastructure to check 1,500 horses each year from June 2019. If the UK leaves without a deal, these Channel-hopping horses - along with their foals - would be subject to veterinary checks not previously necessary. The smell of coffee fills the valley - other brands presumably available elsewhere. "Would you like to be scanned?" Audrey asks, earnestly brandishing a hand-held piece of kit. It could, if I'm not careful, take a 3D map of me, ready to be printed in what looks like plastic. In fact - the 3D printers here use coils made from recycled coffee and shellfish. Image caption Graham and Audrey hope to see a version of the EcoSpace in Sussex soon. Graham loves the setup. He's in talks to bring something similar to the Newhaven area. Next month, both organisations are running a 'start-up cruise' across the Channel, where Norman and Sussex firms will link up. Graham explains there's something else, too. In three years' time, the Normandy region will decide whether to continue subsidising the crossing to Dieppe. "It's a 26m euro a year subsidy from the French side to fund the ferry. From our perspective, how can we make the ferry busier and prove it's value?"